The 650 muscles in the human body control movement and help to maintain posture, circulate blood and move substances throughout the body. While most people associate muscles with strength, they do more than assist in lifting heavy objects. The 650 muscles in the body not only support movement — controlling walking, talking, sitting, standing, eating and other daily functions that people consciously perform — but also help to maintain posture and circulate blood and other substances throughout the body, among other functions. Muscles are often associated with activities of the legs, arms and other appendages, but muscles also produce more subtle movements, such as facial expressions, eye movements and respiration, according to theNational Institutes of Health (NIH). The muscular system can be broken down into three types of muscles: skeletal, smooth and cardiac, according to the NIH. Skeletal muscles are the only voluntary muscle tissue in the human body and control every action that a person consciously performs. Most skeletal muscles are attached to two bones across a joint, so the muscle serves to move parts of those bones closer to each other, according toThe Merck Manual. Visceral, or smooth, muscle is found inside organs such as the stomach and intestines, as well as in blood vessels. It is called a smooth muscle because, unlike skeletal muscle, it does not have the banded appearance of skeletal or cardiac muscle. The weakest of all muscle tissues, visceral muscles contract to move substances through the organ, according to The Merck Manual. Because visceral muscle is controlled by the unconscious part of the brain, it is known as involuntary muscle, as it cannot be controlled by the conscious mind. Found only in the heart, cardiac muscle is an involuntary muscle responsible for pumping blood throughout the body, according to The Merck Manual. The heart’s natural pacemaker is made of cardiac muscle that signals other cardiac muscles to contract. Like visceral muscles, cardiac muscle tissue is controlled involuntarily. While hormones and signals from the brain adjust the rate of contraction, cardiac muscle stimulates itself to contract. Muscles are further classified by their shape, size and direction, according to the NIH. The deltoids, or shoulder muscles, have a triangular shape. The serratus muscle, which originates on the surface of the second to ninth ribs at the side of the chest, and runs along the entire anterior length of the scapula (shoulder blades), has a distinctive sawlike shape. The rhomboid major, which attaches the scapula to the spinal column, is a diamond shape. Size can be used to differentiate similar muscles in the same region. The gluteal region (the buttocks) contains three muscles differentiated by size: the gluteus maximus (large), gluteus medius (medium) and gluteus minimus (smallest), the NIH noted. The direction in which the muscle fibers run can be used to identify a muscle. In the abdominal region, there are several sets of wide, flat muscles, according to the NIH. The muscles whose fibers run straight up and down are the rectus abdominis, the ones running transversely (left to right) are the transverse abdominis and the ones running at an angle are the obliques. As any exercise enthusiast knows, obliques are among the hardest muscles to develop to achieve “six-pack” abs. Muscles also can be identified by their function. The flexor group of the forearm flexes the wrist and the fingers. The supinator is a muscle that allows you to roll your wrist over to face palm up. Adductor muscles in the legs adduct, or pull together, the limbs, according to the NIH. There is no single type of doctor that treats muscular diseases and disorders. Rheumatologists, orthopedists and neurologists may all treat conditions that affect the muscles, according to the American Medical Association. There are a number of common neuromuscular disorders, according to Dr. Robert Schabbing, chief of neurology at Kaiser Permanente in Denver. Common primary muscle disorders include inflammatory myopathies, including polymyositis, which is characterized by inflammation and progressive weakening of the skeletal muscles; dermatomyositis, which is polymyositis accompanied by a skin rash; and inclusion body myositis, which is characterized by progressive muscle weakness and wasting. Other common disorders are muscular dystrophies and metabolic muscle disorders, he said. Muscular dystrophy affects muscle fibers. Metabolic muscle disorders interfere with chemical reactions involved in drawing energy from food.Neuromuscular junction disorders impair the transmission of nerve signals to muscles, Schabbing noted. The most common neuromuscular junction disorder is myasthenia gravis, which is characterized by varying degrees of weakness of the skeletal muscles. Schabbing said. “There are many types of peripheral neuropathies that can be secondary to other medical conditions, such as diabetes, or due to a variety of other causes, including toxins, inflammation and hereditary causes,” he said. Motor neuron disorders affect the nerve cells that supply muscles, Schabbing said. The most recognizable motor neuron disease is amyotrophic lateral sclerosis, or ALS, commonly known as Lou Gehrig’s disease. The most common symptom or sign of a muscle disorder is weakness, although muscle disorders can cause a number of symptoms, according to Schabbing. In addition to weakness, symptoms include abnormal fatigue with activity, as well as muscle spasms, cramping or twitching. Neuromuscular disorders affecting the eyes or mouth can cause drooping eyelids or double vision, slurred speech, difficulty swallowing or, sometimes, difficulty breathing. Electromyography — commonly referred to as an EMG — is often used to diagnose muscular disorders. An EMG helps characterize causes of nerve and muscle disorders by stimulating nerves and recording responses, Schabbing noted. Rarely, nerve or muscle biopsies are needed. Steroids and other medications can help to reduce spasms and cramping. Milder forms of chemotherapy can help treat many muscular disorders, according to Dr. Ricardo Roda, an assistant professor of neurology, neuroscience and physiology at NYU Langone Medical Center. 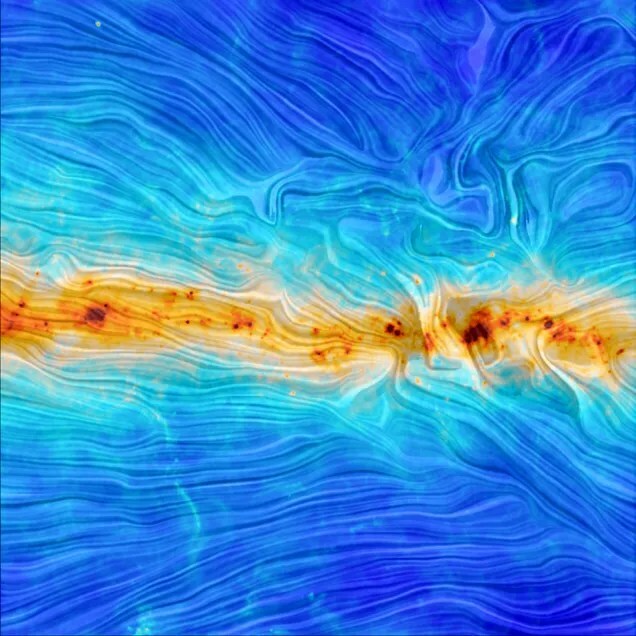 What you’re seeing here are actually two aspects of our galaxy that your naked eye can’t perceive: its temperature, and its magnetic field. The new technique has already been used in several patients, including two high-profile face transplant patients — Carmen Tarleton, who was maimed by her husband and received a face transplant in 2013, and Dallas Wiens, who was the first person in the U.S. to receive a full face transplant, in 2011. “They went from having no face and no features at all, to being able to talk and eat and breathe properly,” said Dr. Frank Rybicki, a radiologist and the director of the Applied Imaging Science Laboratory at Brigham and Women’s Hospital in Boston, who presented the findings today (Dec. 1) at the meeting of the Radiological Society of North America. “Typically, by the time they come to us, they’ve had 20 or 30 surgeries already, just to save their lives,” Rybicki told Live Science. The team printed out the soft tissue for Tarleton, whose estranged husband threw industrial-strength lye (a strong chemical used in soap making) on her face, according to the report. The lye “literally burned off all the skin and all the squishy stuff in the face, and just left the bone,” which was covered by a paper-thin flap of tissue, Rybicki said. Printing soft tissue requires a sophisticated technique, but it was tremendously helpful because, without 3D printing, it’s very difficult to visualize that tissue, Rybicki said. Since her face transplantation procedure in 2011, Tarleton has done amazingly well, and her facial features have truly become her own, Rybicki said. The tissue has undergone dramatic remodeling, and the face no longer resembles neither her original face nor the donor’s face. Now, three years after her operation, it is hard to tell that she was the recipient of a face transplant, Rybicki said. Images of Tarleton’s face will be revealed at the meeting later today. The team also created 3D-printed versions of the new soft-tissue structure at Tarleton’s follow-up appointments. As a result, they can document some of the facial remodeling that Tarleton has undergone, Rybicki said. Having a better understanding of the facial anatomy can also improve outcomes in less dramatic types of facial reconstruction, said Dr. Edward Caterson, a plastic surgeon at Brigham and Women’s Hospital who is part of the same face transplant team. For example, when someone’s jaw is destroyed, doctors typically harvest a piece of rib or leg bone to replace the missing jaw. Because the tibia, or leg bone, is quite straight, it’s tricky to cut it for a perfect fit. 3D printing allows that cut to be done more precisely, Caterson said. “We’re also getting an opportunity to innovate surgically, due to the fact we can do this planning preoperatively,” Caterson told Live Science. Recently, 3D printing enabled Caterson to harvest bone from a completely new location — the femur, or thigh bone. Though doctors often use rib grafts to replace jawbone, ribs don’t have their own blood supply, so they typically collapse after a few years. In this illustration, a reflective panel is coated with a material designed to help cool buildings without using air conditioning. A new superthin material can cool buildings without requiring electricity, by beaming heat directly into outer space, researchers say. In addition to cooling areas that don’t have access to electrical power, the material could help reduce demand for electricity, since air conditioningaccounts for nearly 15 percent of the electricity consumed by buildings in the United States. This material is made of seven layers of silicon dioxide and hafnium dioxide on top of a thin layer of silver. The way each layer varies in thickness makes the material bend visible and invisible forms of light in ways that grant it cooling properties. Invisible light in the form of infrared radiation is one key way all objects shed heat. “If you use an infrared camera, you can see we all glow in infrared light,” said study co-author Shanhui Fan, an electrical engineer at Stanford University in California. One way this material helps keep things cool is by serving as a highly effective mirror. By reflecting 97 percent of sunlight away, it helps keep anything it covers from heating up. In addition, when this material does absorb heat, its composition and structure ensure that it only emits very specific wavelengths of infrared radiation, ones that air does not absorb, the researchers said. Instead, this infrared radiation is free to leave the atmosphere and head out into space. 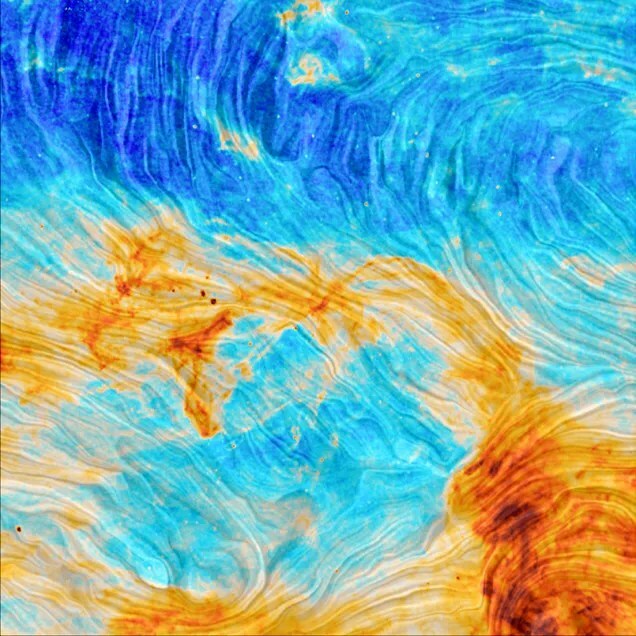 “The coldness of the universe is a vast resource that we can benefit from,” Fan told Live Science. The scientists tested a prototype of their cooler on a clear winter day in Stanford, California, and found it could cool to nearly 9 degrees Fahrenheit (5 degrees Celsius) cooler than the surrounding air, even in the sunlight. “This is very novel and an extraordinarily simple idea,” Eli Yablonovitch, a photonics crystal expert at the University of California, Berkeley, who did not take part in this research, said in a statement. The researchers suggested that their material’s cost and performance compare favorably to those of other rooftop air-conditioning systems, such as those driven by electricity derived from solar cells. The new device could also work alongside these other technologies, the researchers said. The scientists detailed their findings today (Nov. 26) in the journal Nature. 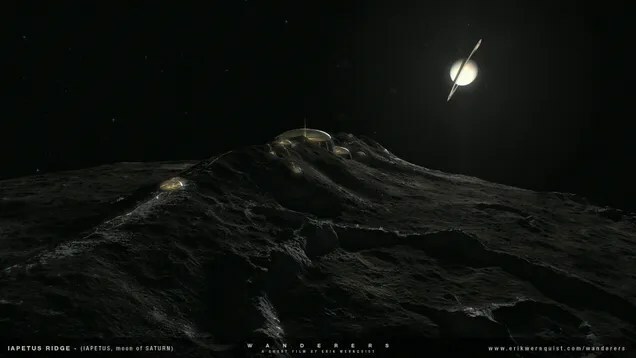 Each of the places depicted in Wanderers is an actual place in our solar system. When real photos or map data was available, Wernquist used them to guide his digital recreations. 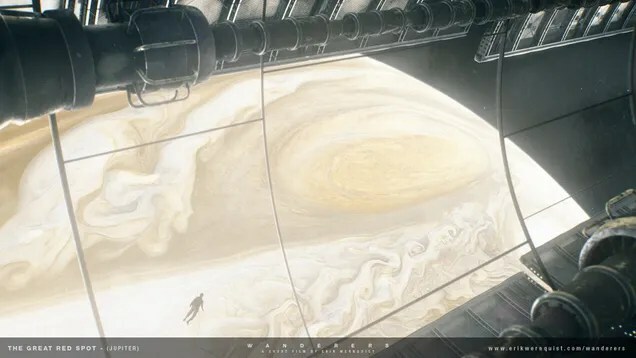 You can read about each of the places and their scientific basis in an accompanying gallery of stills(also on imgur):leaving our home planet, surfing the rings of Saturn, basking above Jupiter’s epic storms, mining asteroids, and so much more. While we’re still a long way off from human deep space exploration, we are getting a tiny step closer with the first space test flight of the Orion spacecraft next week. Currently just a crew and service module, the spacecraft is intended as the planetary crew transport module for an eventual deep space exploration vehicle for asteroid interception or even to carry humans to Mars. 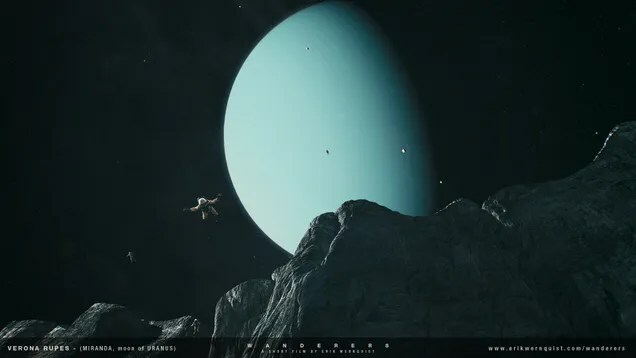 All the alien worlds in this short film are within our solar system, places conceivably within reach of Orion or its descendants. What I truly love about this film is not just that its beautifully-crafted visuals or that it uses science to inform those visualizations. What I love is that it takes humans and places them in a situation where they aren’t just exploring our solar system, but embracing living in all its exotic wonder. 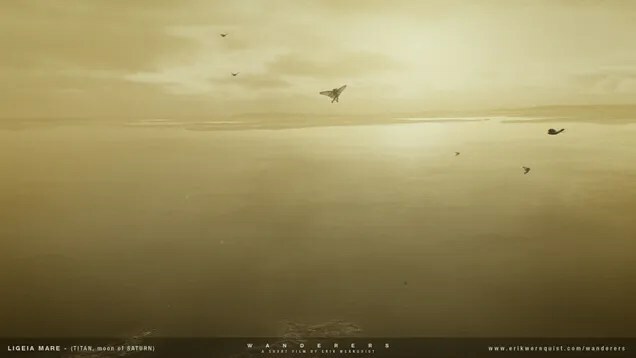 This isn’t just pragmatic visualizations of spacecraft and colonies: it’s taking our love of adventure and applying it to the unbelievable yet totally real vistas beyond Earth. This is a future of skydivers, base-jumpers, ice-cliff climbers, and free divers. This is our solar system as a place open to not just work and life, but also to play. This is a very human vision of the future we could have. 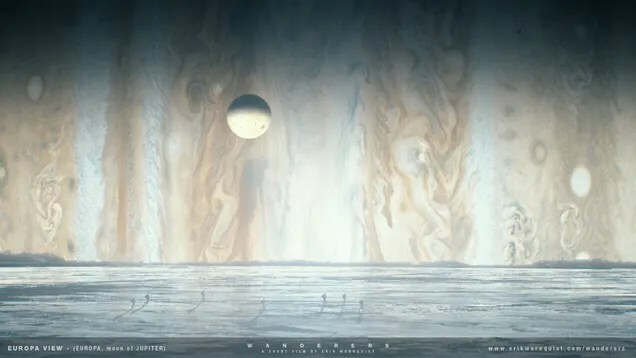 In the film, Wernquist takes a bit of artistic license, but he works with the beautiful parts of what is plausible, not sacrificing science on a whim. 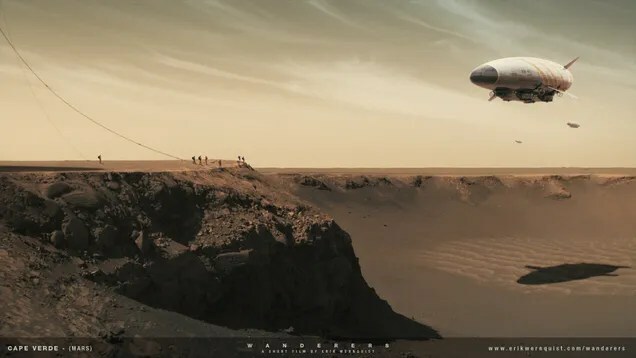 It’d be more scientifically plausible to mount a space elevator on Pavonis Mons, an equatorial volcano stretching 14 kilometers above average surface elevation, but the cratered Terra Cimmeria highlands are more aesthetically pleasing. 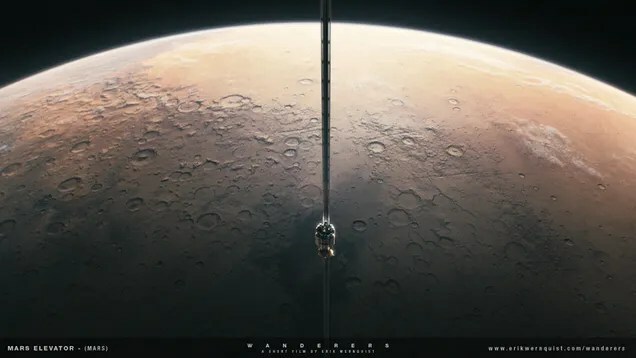 This is such a beautiful merger of science and fiction that I don’t even care about such tiny variations; it’s a minor thing to suggest humans may pick their space elevator location based not just on science but on having a great ascent view! This is a possible future, but it won’t be easy. We’ve got a long way to go on these technologies: How would we build a cable strong enough to function as a space elevator? 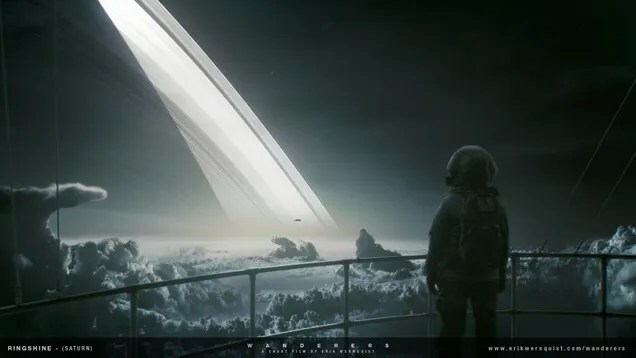 Could we come up with a thermally insulating material adequate to protect from the extreme temperatures on Saturn without a full space suit, even if we stayed floating at a pressure of one atmosphere? 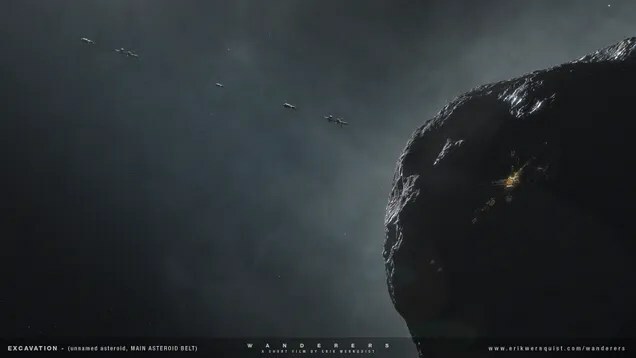 What techniques would be most efficient to mine an asteroid? Can we find a way to protect ourdelicate bodies from radiationoutside the protection of planetary magnetic fields? But the only way we’re going to solve those challenges is if we’re motivated to try. Videos like this, embracing science and dreams, are what will help kick us into reaching out for this future and pushing the boundaries between plausible and possible. While it can feel like a painfully slow crawl, the technology of robots or humans leaving our planet is progressing scorchingly fast. We’ve come from the first uncertain rocket launches andhumans just barely poking into orbit to crew transport to the space station is a task contracted out to commercial bidders and launch explosions are shocking news in under a century. Yes, this is a futuristic vision, but this is a future we could have, if we wanted to and worked hard for it. So much of our solar system exploring is by robots, and I love that. But I am also thrilled by seeing humans survive in the harsh, exotic environment of space, managing to do dull,mundane things in a totally unreal situation. Space exploration doesn’t need to be an all-or-nothing, either-or choice. We can fund both robots and humans, reaching out beyond our planet to explore and immerse ourselves in discovering the true wonder of our solar system. We can do this. Please? As for the story to go along with the film? That’s for you to write. 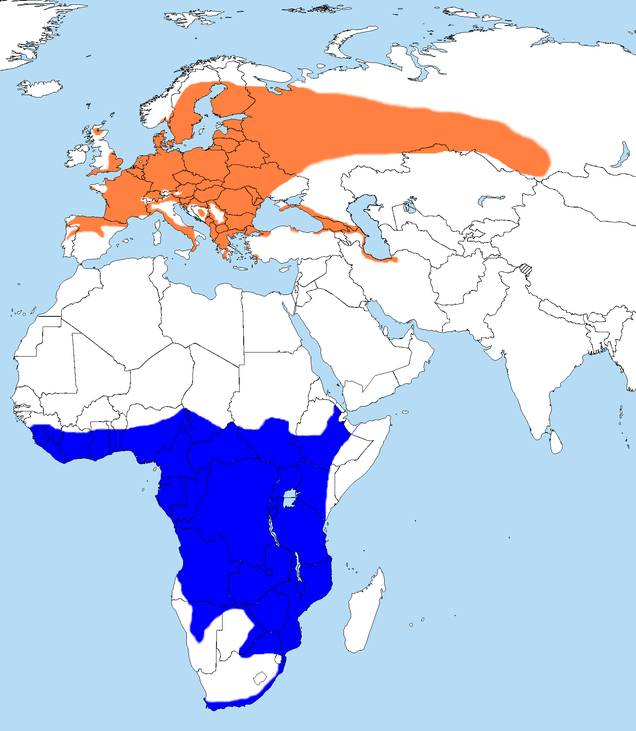 Based on real data (latitude, longitude and height) from the University of Amsterdam the animation initially shows the tracks of 12 birds, but then concentrates on a pair – male and female, as they migrate south in Autumn 2010 from the Veluwe forest in the Netherlands to warmer weather on the African coast (Liberia, Ghana and Cameroon). After wintering in Africa, in Spring 2011 the birds fly back. But en route we see the female lose her way – possibly due to unfavourable winds. After a long journey the male arrives back in the Veluwe forest and waits for her.